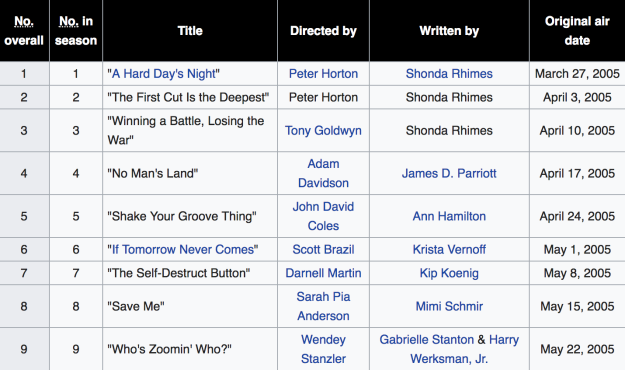 Am I The Only Person Who Didn’t Realize Every “Grey’s Anatomy” Episode Title Is Named After A Song? I’m free falling right now. And while I was scrolling through Netflix looking for episodes to watch — I chose the one where Meredith almost drowns — my heart suddenly dropped into my stomach. And it wasn’t because that little girl was taking too long to tell Derek that the love of his life was drowning. I know you’re in shock, girl…BUT COME ON!!! PULL IT TOGETHER!!! It was because I realized every single episode title is named after the title of a song. BECAUSE IT WAS RIGHT IN FRONT OF MY FACE. BUT I DIDN’T REALIZE THAT ALL OF THEM WERE SONGS. Honestly, someone in the comments better tell me they also didn’t realize this because I’m not emotionally ready to be the only one.